3. Whole Grain Mornings: Breakfast is not only the most important meal of the day, but it is my favorite meal of the day! That means I scooped this book up as soon as it came out. Author Megan Gordon is the blogger behind the beautiful food blog, A Sweet Spoonful and her book is just as beautiful. Whole grain breakfast foods are known for not being as pleasing to the eye or taste buds as the usual alternatives, but Megan has a way of making the food look fabulous and her creative recipes make the food taste amazing. The Very, Very Best Oatmeal is one of my favorites... The stories she tells in the book are entertaining as well. I could see this is as a book I will reference when I have children so that I can get them used to starting their day off with simple and healthy meals. That makes this book even more special to me. 5. Plenty: I make it a goal to try to eat a fresh vegetable or two at every meal - including breakfast (I put them in my morning smoothie). So I am really attracted to cookbooks that introduce creative ways of making a variety of vegetables. That's what I love about this cookbook. The recipes are original and not too fussy. If you aren't big into vegetables, the stunning photos might entice you to change your mind. They are just that good. 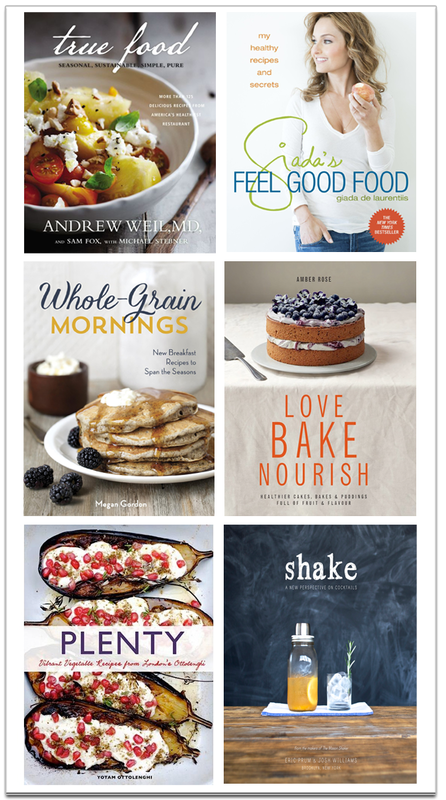 What are some of your favorite cookbooks? ?